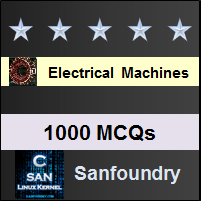 This set of Electrical Machines Multiple Choice Questions & Answers (MCQs) focuses on “Machine applications”. Explanation: Induction motor provides high starting torque with proper values of slip ring terminal resistance. Coupled along with the synchronous motor it acts as an independent set and be employed in high torque application. 2. Which of the following can be used for braking purposes in electric trains? Explanation: Induction generator runs at a speed greater than the synchronous speed. To apply in braking purposes the induction generator can be run in the opposite direction to that of the operating machine direction and stopped. 3. A synchronous motor absorbing 60 kW is connected in parallel with an continuous load of 240 kW operating at 0.8 power factor lag.What is the kVAR supplied by the synchronous motor to obtain a total power factor of 0.9 lagging? kVAR supplied by the motor = 145-180 = -35 or k3 kVAR leading. Explanation: Ac series motor is dc series motor connected to ac supply having an unidirectional torque, which is not very high in magnitude.It is widely applicable for small torque requirements like portable drilling machines, mixers etc. 5. Universal motor is used in vacuum cleaners, table fans and portable drilling machine. Explanation: The universal motor is dc series motor with ac supply with smaller torque. So it can be used for lower torque applications. 6. _______ generator is used in arc welding purposes. Explanation: The external characteristics of the differentially compound generator have minimum voltage for the high current voltages.This is best harnessed feature for a high current requirement by the welding application. a) a booster to maintain constant voltage at the end of the feeder. Explanation: Referring to the external characteristics of dc series generator shows that the terminal end voltage increases as the loading increases from no load to full load. In feeders due to variable requirements the voltage drops while transferring when loading is raised. Explanation: Tappings are provided to tap different levels of voltages at the high voltage end of the transformer.Providing it as low voltage side has no use and it is not economical. Explanation: To obtain a maximum of the voltage in induction regulator, the stator mmf and rotor mmf should be stationary and aligned to each other. Explanation: The components to be used in aircrafts are made to operate at very high frequencies so that the size of the components to be used is reduced. Explanation: As the machine is over excited, it will act as source of reactive power and it is positive.